Increased mobility is possible with stairlifts. Inside or outside your home, a stairlift can take you from one floor to another or from the top to the bottom of a staircase. As you age, your bones become more brittle, and because climbing stairs increases the risk of falls, the chances of injuring yourself at home increase. If you are elderly or disabled, additionally, a staircase turns into an obstruction, blocking you off from part of your home. Not accessing the second floor of your home diminishes your freedom significantly. As mobility devices, stairlifts can be installed into homes or commercial buildings to allow individuals greater accessibility and mobility. In general, a stairlift is a lifting device that uses a track system with a chair and operates with direct or battery power. The chair portion often folds up at either end of a staircase and is equipped with a swivel seat and emergency switch or sensor. Not all stairlifts are the same, and models are based on the two general types of staircases, straight and curved. As a standard design, a straight stairlift can be bought and installed – no adjustments or changes needed. A curved stairlift, however, must fit the shape of your staircase in order to be safe and effective, and as a result, a custom model needs to be put together. Measurements and photographs are first taken of your staircase, and this information is given to our factory. A custom curved stairlift is built in four to eight weeks, and six to eight hours are needed for installation. Because additional labor is needed, custom curved stairlifts cost three or four times as much as their straight counterparts. A home’s or commercial building’s design or an individual’s needs are taken into account for various stairlift models. Older homes, for instance, may have narrow staircases, and an ordinary stairlift may be too large. Compact stairlifts are designed with the right dimensions to accommodate your needs and to fit up a narrow staircase. Similarly, passengers of various body types and sizes may regularly use a stairlift, especially if the device is in a commercial setting. 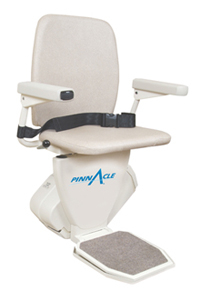 Extra large stairlifts, such as the Indy XL, support up to 500 pounds and can be adjusted to various body types. Outdoor steps may be part of a building or home, and if a stairlift is used inside, one is likely needed outdoors. Equipped with standard features, an outdoor stairlift is built to withstand all seasons and weather conditions.